On Sunday 18th May I joined my fellow classmates in attending the SSSSPOTY competition in London to support our friend, Hugo Catton. Out of 74 students nominated by their schools for the competition, Hugo was one of 12 students selected as finalists. With representatives from GSA winning the competition the past two years in a row, Turlough Convery and Kris Olsen, Hugo had a vast amount of pressure resting on his shoulders as we all came out in force to support him. 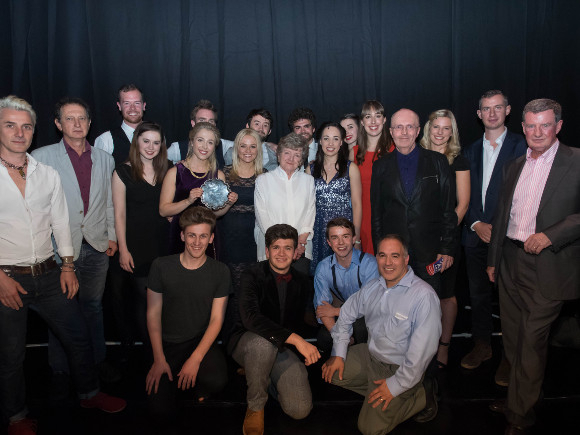 With a packed house of industry professionals, only a piano for accompaniment and other contestants sat on the stage as they sang, the contestants got up one by one to perform their chosen Sondheim song and new song submitted by budding composers. Their level of composure was admirable as they performed without a hint of nerves; I couldn’t imagine being in their situation without getting stage fright. The writing team, Anthony Drewe and George Stiles, introduced the competition and David Bedella hosted the afternoon with American charm. I have a lot of respect for Drewe and Stiles as I used their song ‘Wait a bit’ from ‘Just So’ as my audition song for drama schools, as well as scholarship auditions and many singing events. The song is so beautiful and the lyrics so relatable and true that from the moment I first heard it I knew it was a special song, so I feel like I owe a lot of good things in my life to Drewe and Stiles for helping me on my way. 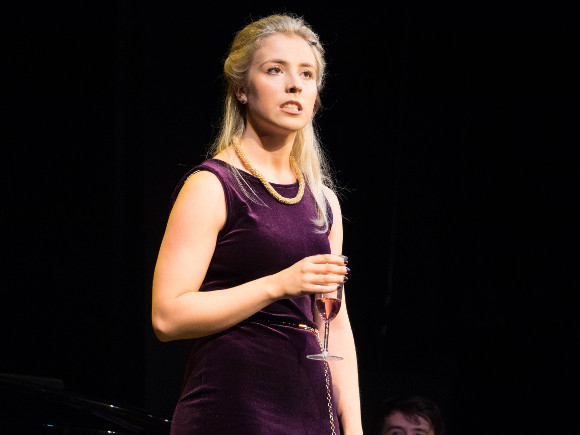 Ironically, the delectable Caroline Sheen sang ‘Wait a bit’ later in the afternoon as the judge’s made their decision on the winners, so it felt like a fitting round up to my final week of drama school, hearing the song that started my journey. Hugo Catton started off the competition with a passionate rendition of ‘Ballad of Booth’ from ‘Assassins’, his deep baritone voice powering through the theatre, getting the afternoon off to a flying start. Luke Francis followed up with two comedic numbers, notably ‘The Procrastination Song’ by Tamar Broadbent went down a storm as every student in the audience related to the theme of struggling to find motivation to write your dissertation. It would have been nice to see Luke do a contrasting piece on a more serious side but his different take on the songs meant that they didn’t feel like they were the same. Whilst Hayley Hampson sang both her soft ballads, ‘I wish I could forget you’ from ‘Passion’ and ‘The Next 1,000 years’ by Jack Robinson and Michael McGregor, you could hear a pin drop as her beautiful poppy voice radiated. Callum McIntyre carried on like a pro when his microphone flew off at the start of his energetic performance of ‘Buddy’s Blues’ from ‘Follies’. Thankfully the song was not lost as he could still be heard without his microphone and the situation didn’t affect his wonderful performance. He then went on to sing a beautiful contrasting piece in ‘Scrapbook’ by Rob Archibald and Verity Quade, this time using David Bedella’s hand microphone so he didn’t have to strain. The lyrics were touching and Callum sang it with such ease that it brought a tear to my eye. Callum, deservedly so, went on to win the Runner Up prize of the competition. The performance of the afternoon, which rightfully won the contest, came from Corrine Priest who trained at LSMT (London School of Musical Theatre). She sang two comedy numbers (‘Don’t Laugh’ from ‘Hot Spot’ and ‘Something for the pain’ by Eamonn O’Dwyer) with such different, entertaining characters that gripped the audience with every word. Her comedic timing showed no bounds as she commanded the stage and had the audience rolling in the aisles laughing. From the moment she finished her second song it was an obvious choice that she would be the winner. The performances all round were of a high standard, notably Jay Worley’s mature rendition of ‘Finishing the Hat’ from ‘Sunday in the Park with George’, and Tamar Broadbent went on to win the Best New Song prize for two of her songs that were chosen for the afternoon’s show (‘The Procrastination Song’ and ‘Library Boy’, also sung by Jay Worley). The competition really showcased some fabulous talent and every competitor is one to watch.